On March 12, 2018 the Chinese FDA (CFDA) approved the clinical trial application of LCAR-B38M CAR-T cell self-reinfusion preparation from Nanjing Legend Biotech, marking the first cellular therapy to officially enter the clinical trial stage in China. LCAR-B38M is targeted at B-cell maturation antigen (BCMA), a member of TNF receptor family and also an extremely crucial B-cell biomarker. In multiple myeloma patients, the BCMA protein has been found on the surface of malignant plasma cells, making it an important potential therapeutic target. At the annual meeting of the American Society of Clinical Oncology in 2017, Nanjing Legend revealed its data on 35 relapsed multiple myeloma patients and sent shock waves across of the industry. It indicated that a total of 33 patients (94%) has shown clinical remissions (complete response or very good partial response) in two months after receiving the experimental anti-BCMA CAR-T treatment. The objective remission rate has reached 100%. For the first 19 patients, Nanjing Legend followed up for more than 4–14 months after the treatment. Of these, 14 patients continued to achieve a strict complete response, and five showed a partial remission. Riding on this eye-catching result, Nanjing Legend became the first company to file for a CAR-T therapy clinical trial application in China (December 8, 2017). In January 2018, CDFA trial center quickly completed the technical evaluation in toxicology and pharmacology. However, by February, things came to a halt because of the requirement of further information. But at the beginning of March, the review was fully completed. Application to approval, then, took only three months. However, the repeated approvals also signaled the CFDA’s seriousness and caution concerning cell therapies. 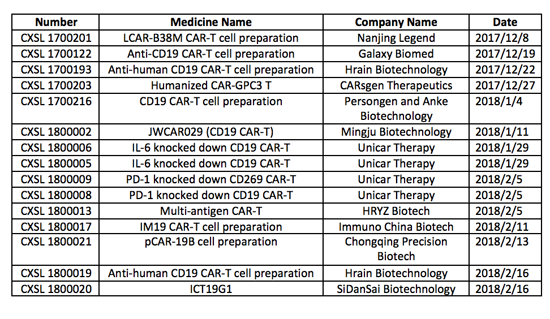 Up to now, a total of 13 CAR-T treatments have applied for clinical trials from CFDA, including Anhui Anke Biotechnology, Hrain Biotechnology, Galaxy Biomed, and Fuson. However, assessing the approval process, other than Nanjing Legend, none has started or is in the process of review. CD19 is still the hottest target. At present, the clinical application number has reached a total of nine. Among them, the rising stars are the anti-human CD19 CAR- T cell injection from Hrain Biotechnology and the anti-CD19 CAR-T lymphocyte injection from Galaxy Biomed. Following right after LCAR-B38M, they both joined the list of drugs included in the 26th group priority review. On December 25, 2017, the anti-human CD19 T-cell injection from Hrain Biotechnology was accepted by the Chinese Center for Drug Evaluation (CDE), becoming the second CAR-T therapy to get in the line for clinical trials in China. Hrain Biotechnology is primarily focused on the research and development of cancer immunotherapy, simultaneously transforming the latest advances in China and abroad. The company strategy is to push forward the CAR-T technology, and at the same time, advance other cutting-edge projects, including CAR-NK, new DC vaccine, and iNKT. At present, Hrain has deployed a series of CAR-T product lines in a number of tumors, including multiple myeloma, adult and childhood B-cell leukemia, and B-cell lymphoma. On December 17, 2017, Galaxy Biomed announced that it had submitted its anti-CD19 CAR-T therapy, co-developed by its subsidiary company Marino and Sichuan University, to CFDA for the clinical trial review and approval. Its current indication is lymphoma. Their improved anti-CD19 CAR-T cells have strong killing capabilities, but at the same time are equipped with very mild cell proliferation, leading to a slow and long-lasting tumor-killing effect. Its current clinical trials indicate that its effectiveness has reached 70% in the low-dose group; it can increase to around 80% in the high-dose arm. Its complete remission rate has achieved more than 55%. In addition to the very good clinical results, its safety profile is very promising as well. Among all 25 patients, only three have experienced hypothermia during the course of clinical trials. No serious adverse reactions have been observed, including serious cytokine storms and adverse neurotoxic reactions. Worth noting is that, other than the CD19 CAR-T project, Galaxy Biomed-controlled Marino is also developing a new generation of CAR-T therapy, called eCAR-T, combining CAR-T and checkpoint inhibitors. So far, eCAR-T has been put forward for a number of patents and several products are already under development, including CD19-eCAR-T (indications: lymphoma, acute lymphoblastic leukemia), Meso-eCAR-T (Indications: lung cancer, ovarian cancer, pancreatic cancer, etc. ), and EGFRvIII-eCAR-T (indication: glioma). Anke Biotechnology is another one to watch. It is slated to start its CAR-T clinical trials in leukemia patients soon. In 2015, Anke acquired 15% share of PersonGen and officially plunged into the field of immunoncology. Thanks to this deal, it also netted the co-development right of PersonGen’s leading CAR-T projects, joining the rank of first-tier cell therapy companies in China. Currently, the company primarily focuses on the development of CAR-T therapies in well-studied targets, such as CD19, and solid tumor markers, such as MUC1. Noteworthy is that PersonGen has established a 2,000 square meter GMP-qualified CAR-T cell production plant, armed with complete quality control systems, facilities, and equipment. This undoubtedly has established Anke Biotechnology at the forefront of this red-hot CAR-T therapy race, setting them up to fully meet the clinical trial requirements for CAR-T cell production down the line. Meanwhile, PersonGen has also penned a collaboration with Miltenyi to build a fully automated CAR-T cell preparation plant in Hefei, in an attempt to improve their R&D, production, and quality control capabilities. Clearly, the CAR-T competition in hematologic malignancy is intensely fierce. However, there is more to come. The fight in solid tumors is even tougher. Unicar Therapy has been leading the CAR-T therapy race in solid tumors. So far, it has registered the clinical applications of three CAR-T products in four indications. Noteworthy is that its CD19 CAR-T therapy, submitted on Jan 31, 2018, is targeted at two different indications — CD19 positive central nervous system leukemia and CD19 positive acute B lymphoma. In China, this is the first CAR-T therapy to launch an attack on central nervous system leukemia (CNS-L), a traditionally hard-to-tackle area. What is promising is that in its clinical study of nearly 10 CNS-L patients showed no serious side effects in the central nervous system have been observed; all of them have achieved good results. More interesting is that its two submissions on February 6, 2018 combined the newest gene editing technology. One has knocked down PD-1 on the basis of CD19 CAR-T cell injection, intended to treat the relapsed CD19 positive lymphoma. The other one is also PD-1 knockdown, but focuses on CD269 instead; it is developed to apply in the CD269 positive multiple myeloma. CARsgen Therapeutics, founded in 2014, has developed multiple CAR-T therapies against solid tumors. Different from traditional CAR-T therapies, it strives to improve CAR-T’s tumor-killing effects through combining chemokine receptors and cytokines, such as IL-12, to strengthen the native and adaptive immunity, in an effort to combat CAR-T’s severe side effects. At present, CARsgen has multiple pipelines under development, including the first CAR-T therapy for hepatocellular carcinoma (HCC) and the first for glioblastoma tumor (GBM) in the world. According to statistics, more than one hundred CAR-T clinical research projects from China have been registered, surpassing Europe and only second to the United States in number. The approval of first CAR-T clinical trial in China marked the end of the Chinese cell therapy industry’s initial exploration and the official beginning of a new period of development. Regulation and innovation are important foundations for the rapid advancement of China’s CAR-T treatment. They are also the basis to propel a definite growth of cellular therapy in the future. On December 22, 2017, CFDA published “Technical Guidelines for the Research and Evaluation of Cell Therapy Products (Trial)”. This document provided clear and flexible acceptance guidance in a number of areas, including the standard of production materials, the testing standards for product quality release, selection of animal models for non-clinical studies, drug clearing procedures, and clinical data collection. There is more to come. On December 28, 2017, CDFA further issued “Opinions on encouraging drug innovations and the priority review and approval from the general administration”. “Opinions” pointed out that drugs for malignant tumors, rare and children diseases, AIDS, etc., can enter the priority review process. These policies are to deepen the understanding of cellular therapy, such as CAR-T, and to promote new drugs with great clinical values. Undoubtedly, an increasing number of patients will benefit. Currently, the market price of CAR-T therapy is predicted to be approximately around $63,000 to $79,000 per treatment in China. The total market volume is expected to reach $3.6 billion to $4.5 billion.